A composite of enhanced color images of Pluto (lower right) and Charon (upper left), taken by New Horizons as it passed through the Pluto system on July 14, 2015. 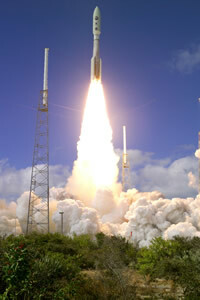 New Horizons launches from Cape Canaveral Air Force Station, Florida, at 2 p.m. EST on Jan. 19, 2006. 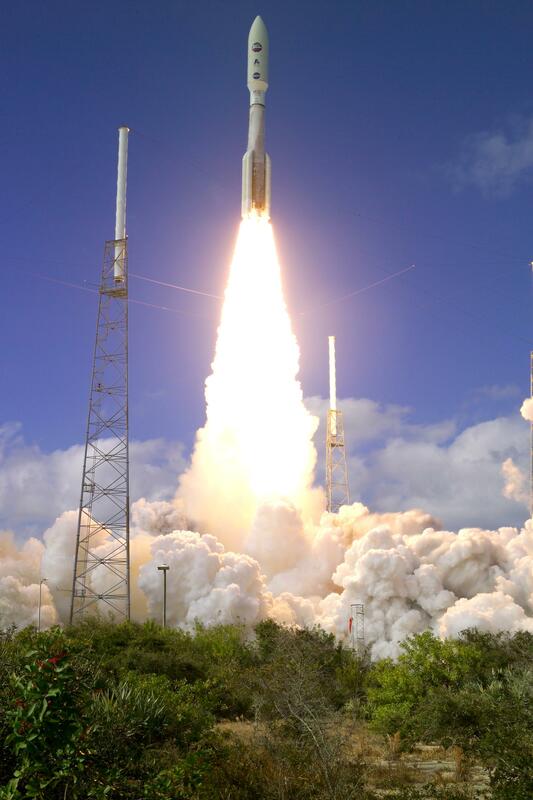 Ten years ago today one of the great robotic explorers of our age – NASA’s New Horizons spacecraft – rocketed into the sky above the Florida coastline. The tiny probe – weighing barely 1,000 pounds – sped from Earth faster than any spacecraft before it, embarking on a 9.5-year voyage across more than 3 billion miles that culminated last summer in the historic first reconnaissance of Pluto and its family of small moons. Today, New Horizons, now far beyond Pluto, continues to send back data from that July 14 encounter, and the detailed views of these strange new worlds on the planetary frontier have amazed scientists and the public alike. The excitement of scientific discovery may have pushed the launch further back into collective memory, but the event that started New Horizons toward Pluto and the once-unexplored Kuiper Belt still has special meaning to the team that designed, built and then guided the spacecraft through the solar system. 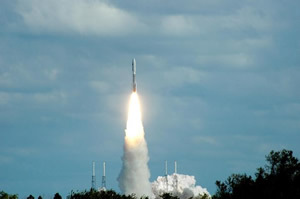 New Horizons lifted off at precisely 2 p.m. EST aboard a Lockheed Martin Atlas V launch vehicle specially equipped with a Boeing third stage, making it the most powerful rocket NASA’s science program has used in this century, and sent it flying from Earth at more than 35,000 miles per hour – the fastest departure of any spacecraft before or since. Just 13 months later, New Horizons flew past Jupiter, getting a gravity assist that added another 9,000 miles per hour to its pace toward Pluto, and giving the team a chance to train the spacecraft’s instruments on the giant planet and its largest moons. The Jupiter flyby was a mission in itself, helping the team gain flyby experience and producing discoveries that included the first close-up looks at lightning near Jupiter’s poles and the first motion-picture sequence of an erupting volcano on the Jovian moon Io. The spacecraft began hibernating after the Jupiter flyby was complete, but mission activity barely slowed down from there. 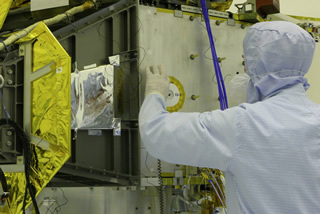 While New Horizons continued across the solar system at record speed, the science, spacecraft and operations teams designed and practiced the intricate activities of the upcoming Pluto encounter. The spacecraft spent more than two-thirds of its seven-year cruise between Jupiter and Pluto in hibernation – which saved wear-and-tear on its systems and required fewer tracking resources at home. Busy as they were, just as much was happening for the team outside of the major responsibility of moving New Horizons through space. Sepan points out that she had been engaged for less than a month when New Horizons launched; she’s now a married mother of two. 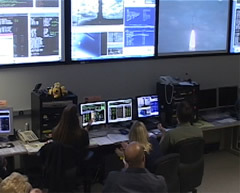 Fellow flight controller Melissa Jones said her family “didn’t exist” in January 2006; when the spacecraft flew by Pluto last July 14 she watched the festivities at APL with her husband and three children, ages 8, 6 and 4. 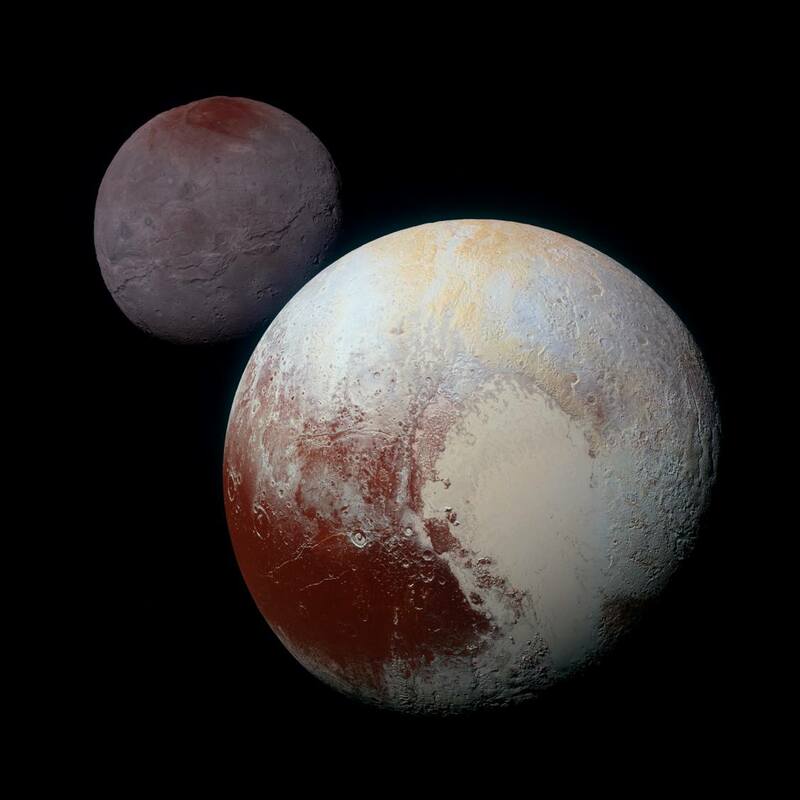 The Pluto encounter began in January 2015, with distant images of Pluto and Charon the team used mostly for navigation. As New Horizons sped closer and the Pluto system grew from a pair of tiny white dots into a dynamic, colorful system of worlds, the milestone that seemed so far away on that mild January day was becoming more and more real. And as New Horizons began delivering the data and close-ups of Pluto and Charon that have dazzled the world – and opened the door to a new realm of the solar system that is unlike anything seen before – the sense of anticipation that began at launch has given way to a sense of pride and accomplishment. More than 430,000 explorers signed up to place their names on the New Horizons spacecraft – are you one of them? Click here to search for your certificate. The launch aboard the Atlas V – capped by a kick from a STAR-48 solid rocket motor – placed New Horizons on a very accurate path to Pluto. Using computer models before and just after launch, mission designers had predicted and planned for 25 propulsive maneuvers (called trajectory correction maneuvers, or TCMs) to deliver New Horizons to the precise Pluto flyby point; as it turned out, they only needed nine.